The Los Angeles River has undergone a renaissance in recent years. After decades of periodic flooding, levees and other flood plain improvements turned the tributary into little more than a squalid, concrete afterthought. But over time the city has focused attention on this gem, as wildlife began to thrive and new bike paths offered great routes for bicycling to escape LA’s crowded streets. Now a recently completed study proposes that an area hugging the river in northeast Los Angeles could turn what is now described as a “food desert” into a food production area. In the future, water from the Los Angeles River could finally help cultivate food instead of being dumped elsewhere in the city. 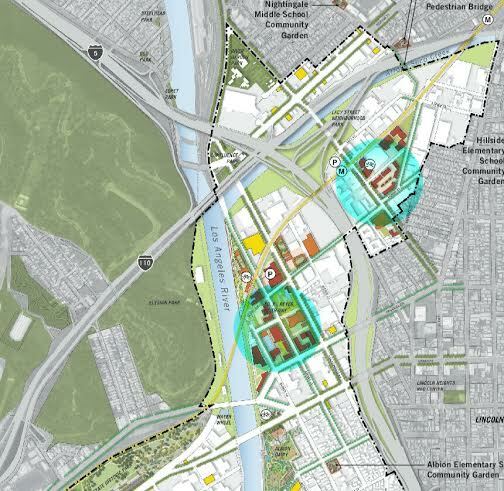 The global architecture and design firm Perkins + Will released an urban agriculture plan that suggests a 660-acre area near Dodger Stadium, straddling the neighborhoods of Chinatown, Mount Washington and Lincoln Heights, could be revitalized with investments in urban agriculture and food companies. This study complements the city of Los Angeles’ plan for the region, or CASP (Cornfield Arroyo Seco Specific Plan), which seeks to redevelop the area as a mixed-used development for a 21st century LA. In sum, that means an area that's transit-dependent, pedestrian friendly and free of parking requirements. Now, Perkins + Will insists urban farming can be added to the mix. The base of such an agriculture hub would be the buildings that remain from the area’s industrial pass. Abandoned or underused lots, rooftops, and community gardens are among the spaces Perkins + Will believes could be devoted to growing food. And, according to this study, the possibilities are numerous: insect farming, aquaculture, fungiculture, small animal husbandry, beekeeping and even ranching would be possible in this historic and now rapidly changing area. The new face of northeast Los Angeles? Long an afterthought in a city known more for the beach communities, Westwood, Hollywood and now Silver Lake and even the San Fernando Valley, this understated section of LA has a history of farming. And many of its residents already grow food in their yards or balconies — and therefore it's really the “last frontier” of LA. But Mount Washington, Lincoln Heights and surrounding areas of LA also pose opportunities for urban agriculture because of their location. The neighborhoods there are close to downtown Los Angeles and its public produce and flower markets. The area is linked by rail and, of course, the dreaded Interstate Highway 5 and Interstate 10. The local infrastructure, however, needs a lot of work. One of the oldest areas of the city, this section’s roads are in pitiful shape, and its location between downtown and outlying cities such as Pasadena means city streets, especially old Avenue 19, are often clogged with traffic as commuters try to avoid the major highways. Traffic is not the only concern that needs to be addressed before turning this area into a modern agriculture center. The Los Angeles River poses problems as well as opportunities: This waterway receives and channels copious amounts of water, but most of it is from storm drains and would need to be treated before it's used to help cultivate food. The fact that the heavy industries that once operated in the neighborhood could have contaminated the soil is also a concern. And while food stores are severely lacking in this area, so too are countless other services. Residents living within the area often drive up to 10 miles for children’s sporting events, playgrounds or even park space to enjoy a picnic — and those who have called this place home may have other ideas on how they want their neighborhoods transformed. To the report’s credit, the authors address these issues front and center in the study. And in the end, jobs could grab locals’ attention. Most big urban projects result in temporary jobs such as construction or work such as retail. An integrated agriculture and food industry would mean long-term, decent-paying jobs. But will it ever happen? Trying to accomplish any major project in Los Angeles is a headache. The city’s position of mayor is, by design, a weak one -- with city council members and government agency heads often treating their districts as fiefdoms. They, in turn, must deal with a board of supervisors, the five members of which overlook a constituency much larger than the average U.S. congressional district’s population. But the city’s current mayor, Eric Garcetti, is known for supporting innovative ideas such as this urban agriculture proposal. City council member Gil Cedillo, whose district includes the CASP area, is pushing for community gardens within local schools. Most urban agriculture plans are one-off projects scattered around cities, but Perkins + Will is on to something. Add the fact that commercial kitchens are starting to open in this section of town, and the idea of Los Angeles becoming an urban farming locus could actually move from artists’ renderings into reality.